Home NHL Wyshynski's Weekly Reader: Dark days in D.C.
Wyshynski's Weekly Reader: Dark days in D.C.
Hello, and welcome to the Weekly Reader, which will run every Friday and collect news and views from around the hockey world on the week’s biggest stories. Have you seen something worth highlighting here? Hit me at greg.wyshynski@espn.com, or do the same if you have suggestions for the column going forward. Enjoy! That was my friend Tarik El-Bashir of NBC Washington as I was walking into the Kettler IcePlex. The Washington Capitals were on another underwhelming run of games, including a humbling loss at home against the Calgary Flames. When a national writer drops in for a random practice during such a stretch, it’s seen as a harbinger of doom. “If you’re here, things have to be that bad,” said another scribe. Well, not yet. The Capitals entered Black Friday with a 12-10-1 record and in a wild-card spot. The days of pushing for division championships for this group are over. The question is whether their days as a Stanley Cup contender are done as well. There’s always a sense of impending disaster around the Capitals. It’s a stench that you can’t Febreze out of the seats in the arena. I remember general manager Brian MacLellan being one of the first people around the organization to mention this sense as being a real thing, but then that guy is honest to a fault. Like when the Capitals were eliminated (again) by the Pittsburgh Penguins in last season’s playoffs, and he admitted they had gone all-in (like in acquiring defenseman Kevin Shattenkirk) and then fell short of playing for even a conference championship — something Alex Ovechkin and Nicklas Backstrom have never done. The “non-championship hangover” earned some guffaws from the team’s haters — because it’s basically the most Capitals thing ever — but I can’t help but believe MacLellan’s postseason comments are the unofficial slogan for this season’s middling team: They gave it their best shot in 2016-17. It took three years to get there. It still wasn’t good enough. The Capitals are their usual soap opera. Backstrom and Ovechkin started the season on different lines and remained there until this week, when coach Barry Trotz reunited them. They produced a goal in the win over the Ottawa Senators. Ovechkin has 14 goals and 7 assists on the season; Backstrom has struggled to 3 goals and 13 assists, with his helper on Ovechkin’s goal on Wednesday night his fourth assist in 14 games. There’s talk around D.C. about animosity between the two stars, but then there’s always been that talk. Again, these are things you hear when they’re not drowned out by victory celebrations. Evgeny Kuznetsov has 26 points in 23 games, and yet there’s still a sense that he’s not the same dynamic player in the regular season that the Capitals have witnessed in the postseason. The blueline is thinner than it’s been in years. The forward group is offensively challenged after the top six, and they miss both Andre Burakovsky (injured) and Marcus Johansson (cap casualty, traded to the New Jersey Devils). The greatest thing the Capitals have going for them is goalie Braden Holtby, who has a .920 save percentage and a 2.62 goals-against average entering Friday. The great equalizer for any playoff team is goaltending; if Holtby can avoid the Penguins in the postseason, I’m sure he’ll be fine. Finally, there’s the coach. Trotz is in his fourth season in Washington. As with every coach of a struggling team, you hear whispers about how hot his seat is. His successor could already be on the bench in Todd Reirden, his rising-star assistant. Trotz is one of the all-time nicest individuals in the Capitals’ organization. He’s also never coached a team past the second round. So in light of the “non-Cup” hangover, in light of the lineup, in light of all that are the Capitals this season, what’s the message from Trotz? “You look back to 2014-15, after 22 games, we had 24 points. We ended up with 102. We were a pretty good team. And we’re one point behind that pace,” said Trotz on Tuesday. Even if everyone around the organization is convinced they see an iceberg in the fog ahead. 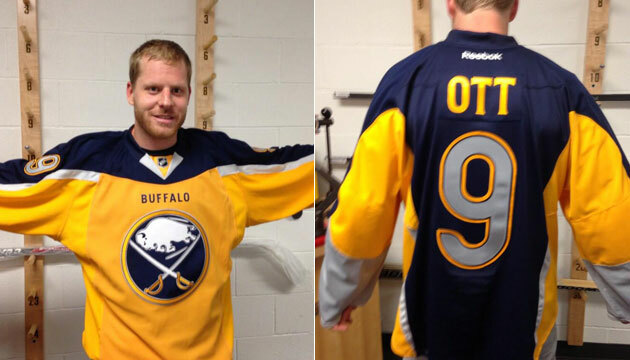 Now, the Sabres’ primary crest is a gold-standard logo in the NHL. It’s impossible to screw up a jersey that it’s adorned on. OK, almost impossible. This is a gorgeous clean look with a retro Buffalo logo on the shoulder as well. Just sublime. I guess this is what happens when a team goes 10 years between Winter Classics: Just a simple “road jersey” does the trick. Let’s establish one thing: The dark blue on a Rangers jersey will always be an improvement over their usual colors. It harkens back to the Statue Of Liberty look that the team hopefully brings back in the Adidas third-jersey typhoon that will hit hockey fandom next season. That said, is there really a market for another diagonal-name-on-the-front, random-stripes-everywhere look? Like, take that “NY” patch and make it the primary logo and just print money, no? Please leave your Winter Classic “Pass or Fail?” assessments in the comments. The way the Toronto media starts circling a great player on a struggling team like it’s his manifest destiny to fill a need on the Toronto Maple Leafs will never stop being entertaining. It was Arizona Coyotes defenseman Oliver Ekman-Larsson‘s turn to go through this particular car wash recently, with stories about him in relation to the Leafs here and here and also here and there. Again, most of these stories are of the “rumor control” ilk, but there’s really nothing like seeing a player like him through that lens whenever a team like Arizona drops into the Centre of the Hockey Universe. As for his future with the Coyotes, three things are certain: That GM John Chayka firmly believes that Ekman-Larsson is a pivotal part of whatever they’re building there; that coach Rick Tocchet is being tasked with lighting a fire under the behind of Ekman-Larsson, whose play has been inconsistent; and, above all else, his pending unrestricted free-agent status in the summer 2019, which in the end is the catalyst for whatever they decide on him. My favorite thing about the 100th anniversary of the formation of the National Hockey League, which was celebrated in Montreal last weekend, is that the League was founded on complete spite. Eddie Livingstone was the owner of the Toronto Blueshirts of the National Hockey Association, an NHL precursor. As the story goes, he was enraged that there was another Toronto-based team admitted into the league in 1916 called the 228th Battalion, representing the Canadian military. He hated the competition. The rest of the six-team league’s owners, as it turns out, rather hated Livingstone, too. He was a vocal critic of its scheduling and stood in the way of some if its revenue-generating initiatives. And you never stand in the way of a group of owners and their revenue-generating initiatives. In February 1917, the 228th Battalion was called away for duty overseas, forcing their franchise to fold and leaving the NHA with five teams. Oh my, you can’t play with just five teams, so the rest of the owners decided to fold the Blueshirts and made a gentleman’s agreement with Livingstone that they would bring him and his team back the following season in a balanced league. Fooled you! They actually dissolved the NHA and, on Nov. 26, 1917, founded the National Hockey League, which featured the Montreal Canadiens, Montreal Wanderers, Ottawa Senators, Quebec Bulldogs and no Eddie Livingstone, who would spend the next decade trying to sue his fellow owners, to no avail. What a savage origin story. Emily Kaplan’s piece on the food NHL players cook is just dandy. Read it now as you digest.